Wow, that is a definite steady-state power reduction! Hmmm, it may be a crude scheme for protecting the power chain: after detecting a drop in voltage, the source cuts back the current just in case the voltage drop was caused by a poor (i.e., higher-resistance) connection. Tesla does this (gradually) and I've experienced it with the Tesla fairly often when charging in "iffy" places. Interesting to hear what ChargePoint has to say. It has been a week now with an "open ticket", asking Chargepoint about why the power often drops from 3 to 1.1 kW, with no reply from Chargepoint. So I'm not holding my breath for an answer, but I'll keep checking that site. But since it has yet to happen on my Volt, I bet it is a MiEV initiated drop (or a MiEV / Chargepoint interaction phenomenon). Below is Chargepoint's reply. They say the drop is due to a car pulling current from the other half of the station. I don't think it is correct, since the first time the severe drop happened I went back and replugged my car in. I do not recall another car being plugged in next to it. But I'll be watching for that in the future. Thank you for contacting ChargePoint support. Your inquiry was just recently put into our email support queue after processing through the system. My sincerest apologies for the delay in response as we respond to the emails in the order they arrive. I will be happy to help you with this. The station you provided is a station that has power share on it. This means that when there is more than one vehicle charging on the station at the same time the station cuts the power in half. The amount will fluctuate based on the energy coming in to the station and vehicles charging. A vehicle that can only charge at 3 kWh may end up with a charging rate that fluctuates due to the other vehicle charging. If the other vehicle can charge at a rate of 6.6 kWh or up, they may actually pull a larger amount causing the vehicle that can only charge at 3 kWh to get less that their maximum. Unfortunately this is a byproduct of stations that are unable to have designated breakers for each port. I apologize that I could not provide better news. Kevin, thank you for following-up with your post. A plausible explanation if the other car has a 6.6kW OBC, although why would it happen at the end of our i-MiEV "timeout"?. I think we'll all pay a bit more attention to this and post here once we learn more. I have opened a new ticket with Chargepoint, since I think their explanation misses the point. My request to them is pasted below (minus the screenshots I emailed them). Ticket #1257292 was closed out with an explanation which does not match the facts/observations. Please see the two attached screen shots. This afternoon my car is slowly charging again, and it is the only car charging. The myimiev.com forum describes how the MiEV cars will sometimes 'take a rest' while charging. So that explains going to zero. But what is not understood is why Chargepoint charging resumes at such a reduced power, likely when the cars requests charging again, without the plug being physically moved. If I go there and unplug, re-activate and plug in, it will again immediately start at 3kW. But I do not want to baby sit it to get 3kW. Could you please figure out why this is and let me know how to get the 3kW charging more often, even after the MiEV 'rests'? Below I hope to paste a complicated charging power 'trace' from last week. It started at about 2.2kW, since another car was also charging. 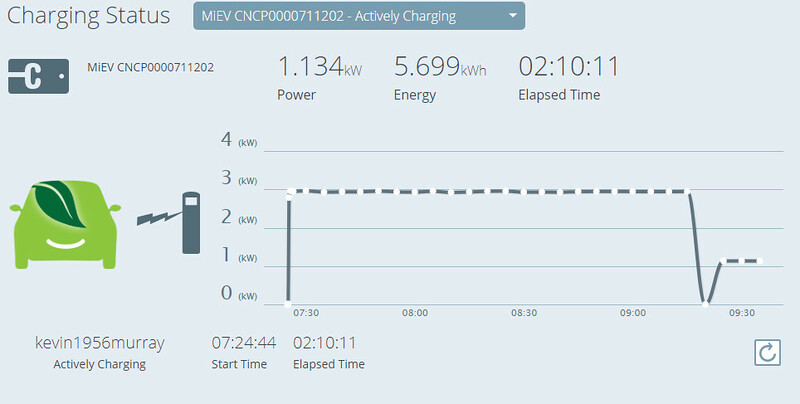 While I was away it looks like it blipped up to 3kW, likely when the spot next to the MiEV was available for a few minutes. Then it did the usual drop to zero, then restart at just 1.1kW. Then it bopped back to 3kW on its own, which is the first time I have seen it do that. Usually once it is at 1.1kW, it will stay there, even if for the next 5 hours. I have been thinking that this is a MiEV/ChargePoint handshake phenomenon, from after the MiEV 'rests'. But now I am thinking the drop to 1.1kW is totally controlled from the MiEV, like the ChargePoint guy on the phone told me when I first called about it. So if any other MiEV owner is seeing this, or has heard that there is such 'throttling', I would like to understand it better. Wow, thank you very much for posting this graph! I've never seen charge level changes like this. Up to the car's OBC (On Board Charger) maximum, the EVSE supplying the power tells the car how much it can deliver. Nice to see that it did jump up to full power, after which the car did its normal full-charge taper. My guess would've been that the i-MiEV charge pause was causing a power-share station to give more to the other car, only leaving a few amps left over for the i-MiEV when it resumed charging. However, it doesn't sound like that's the case since there was no other car charging. It seems to me that the pause is screwing with the station and the station could be lowering the pilot signal to try to get the car to start charging again. I'm trying to get my power history from Chargepoint for my previous charge sessions to see if anything similar happened with my cars. 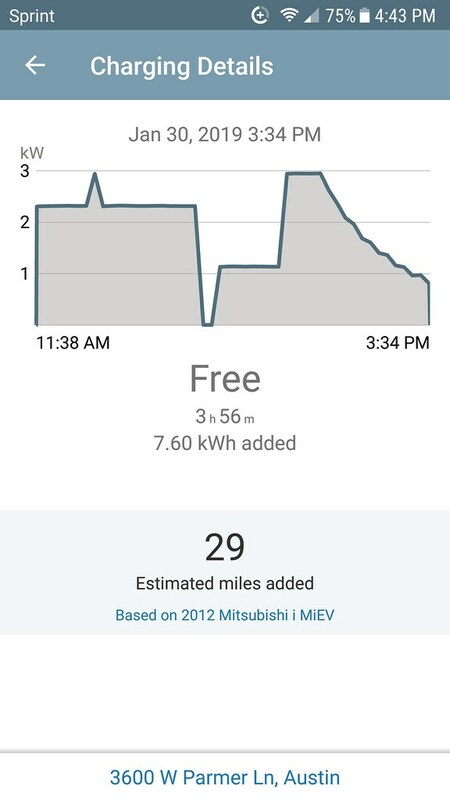 The only good charge I have shows an average of 2.3 kW over the session (no power graph), but it's unclear if the session includes a long period of time between "car finished charging" and "card swipe and unplug" (this particular charge was 2.5 years ago on an old single-head EVSE). The other possibility is that the car does this on other stations (that lack Chargepoint's detailed reporting) and is a symptom of an aging pack. If we can get a day with minimal salt on the roads, I can go do a charge session on a new Chargepoint unit and see what it does. My silver i-MiEV still has the original LEV-50 pack in it. It's hard to know what is happening without special equipment. I think that there has to be a firmware issue with the ChargePoint EVSE, whereby it's not handling the pause correctly, at least under some circumstances. It will be difficult to get through to them that they have an issue. I think that some software engineer at ChargePoint needs to have an iMiev that frequently pauses to test with and debug their code. I wonder how this could be facilitated. Edit: maybe it's like this. The site has a total available power of 4.4 kW. There is another vehicle charging initially; when the iMiev starts charging, they each get 2.2 kW each. Good so far. Other vehicle stops charging, iMiev gets 3 kW, another vehicle starts charging, they both get 2.2 kW again. Still good so far, but each time the power share is changed, some vehicle started or stopped charging. Now the iMiev charge current goes to zero in the pause. The EVSE isn't expecting this. Maybe it assumes that the iMiev has stopped charging, so it can allocate 3.3 kW to the other vehicle. Still all good. So according to this guess of mine, the problem is that the ChargePoint EVSE only shares the power when a vehicle starts or finishes charging, or when the power goes to zero. It should be sharing all the time, or at least say once per minute. For example, as the iMiev charge rate is tapering down, the power available to the other vehicle should be tapering up. This sounds like a pretty simple fix, but it requires getting the idea that they have a problem to the appropriate engineer. Maybe the above graph could do it. But how to get the attention of the right person?